Fun With Frisian: TSJIN - "against"
Tsjin is another common and useful word to know. It means "against" and is pronounced with an initial ts- as is "tsar," and with a -y- blending into an "ih" as in "gin." TSYIHn. Today's example comes from Omrop Fryslân. Omrop means "a broadcast channel," and it literally breaks down as a combination of the word om discussed in the very first lesson and rop meaning "call" or "cry." Say rop with a long "oh," like the English word "rope." 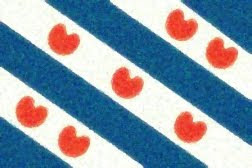 The West Frisian word for Friesland, Fryslân, has been discussed previously here. Fryslân nimt maatregels tsjin de waarmte. Friesland takes measures against the heat. You can click this link to hear the sentence in the introduction to the full newscast. Nimt is from the infinitive verb nimme, a word which can have many meanings, among them "to take," "to get, acquire, or attain," " to engage," or "to adopt." The infinitive is said with an "ih" as in "brim" and a final schwa. NIH-MUH. The third-person form is said with an "ih" vowel as well. Maatregels means "measures." Say it with a long "ah" as in father, an "ey" as in "ray," and final schwa. MAHt-rey-guhls. As always, de means "the" and takes a schwa. Waarmte is a nice, convenient cognate. Say it with an initial v- followed by a long "ah" as in "father" and a final schwa. If you listen to the beginning of the broadcast, notice that the -r- is more rolled than it is in English. VAHRM-tuh. As a bonus, hjoed means "today" as is said with a long "oo" as in "mood." You can hear how the initial h- is hardly said at all. In P. Sipma's book, the pronunciation is likewise given as starting with an initial y- followed by an "oo" and a schwa. YOO-uhd.